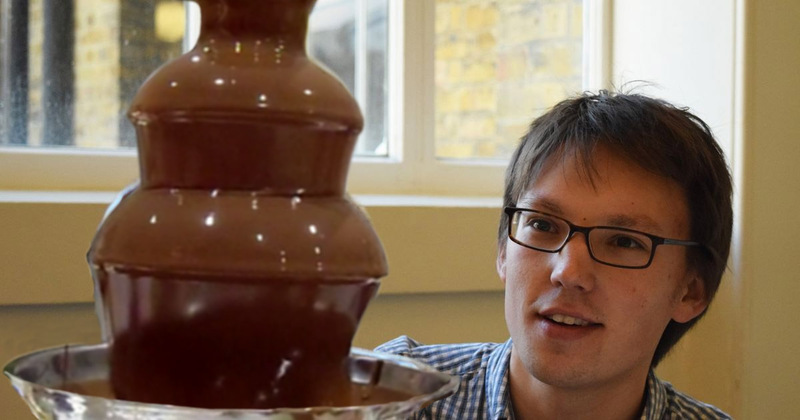 In my masters year I worked on a project, The fluid dynamics of chocolate fountains, with Dr Helen Wilson at UCL, which was published in the European Journal of Physics in December 2015. I also give popular mathematics enrichment talks on the maths of chocolate fountains. Abstract: Chocolate fountains are popular features at special events. But why do they never use white chocolate? Would they work with water? And why, when the chocolate falls, does it fall slightly inwards? In this most delectable of studies, we investigate the trade-off between accuracy and simplicity in models used by commercial chocolatiers. In different geometries of the fountain, we solve the governing equations—mostly analytically—and compare these results with observations from our own fountain experiments. We find that, with some limitations, our models are in fact good for a number of non-Newtonian fluid problems. Marshmallows are, sadly, not provided. The fluid dynamics of the chocolate fountain. European Journal of Physics 37 (1), 015803. Heart Breakfast with Ed & Rachel: Chocolate? It’s Good But What Else Can We Fountain? * Guide to Dutch puns: In Dutch you can say “I cannot make chocolate out of something”. This means that you don’t understand it at all. So, the headline reads: If you cannot make chocolate out of maths, do the reverse. And ‘spanning’ (= tension) can also mean the state of being excited. (Or it can mean stress, as Google suggests). Thanks to Mark Beekhuis at BNR for translating! Latest version: 20/03/2012. This contains some mistakes which have been fixed in the published paper, but also contains some more problems we looked at, and some more explanation of many of the steps. If you notice any mistakes, or have any questions, then please email me.